Our children are an amanah (trust) on to us from Allah: it’s our duty to nurture, educate and protect them as they grow into productive adults. Moms, it’s very important to take some time out to ponder and reflect on the part you are playing or have played in your children’s journey of life. Do your children know their relationship with their Creator? Remember: all that they do will be written down, and when their book is presented on the Day of Accountability – the contents will be based on your work! Ask yourself: what are you doing to ensure that your children’s book will reflect righteous deeds, good character and true success? How confident do you feel about reporting back to Allah and being able to say:”Allah I raised my children with ihsan (excellence) to the best of my ability in accordance and obedience to Your laws.” What a wonderful feeling will this be? How do we perform the most important role on earth? Children have an innate nature of being self-centred: when all their needs are fulfilled, they are more naturally inclined to help. We want our children to grow up with self-discipline, morals, self-esteem and responsibility. Taking on responsible roles at an early stage helps develop many qualities in children that will benefit them and the ummah in the future. From birth, start talking to them about Allah , tell them how much you love them and how you will do your best to ensure they grow up being responsible Muslims, within a framework that they can flourish and grow comprehensively. Understand that each child is born with individual, inherited personality traits that are beyond our control as parents. It’s for us as parents to identify the unique characteristics and behavior of our children. Also know that children cannot be molded or pushed in directions we like. When we understand this we will be able to provide them with the guidance, nurturing and support they need to fulfill the potential Allah has bestowed them with. Teach them to say “la-illaha illa Allah” (there is no god but Allah) as a start of establishing the love of Allah. Instill in them the belief that all things happen by the will of Allah : if they ask you for something, ask them to pray two rakaahs with you and make du’aa to Allah to provide whatever they want. This way, you’re teaching your child that when we ask, we ask from Allah alone, and we rely on Allah for our provision. Teach them to love Allah and follow His laws through your conversations with them. It’s absolutely crucial for our children to understand why we have to obey Allah and His laws – it’s the essence of our worship. Be punctual with your salah, get into the habit of praying at the earliest hour, teach this to your children, and they will be more than likely to be punctual in everything else they do. Make prayer times a family event: even if children are not of age, let them join in or sit quietly; so that when salah becomes obligatory upon them, they are firm and ready to speak to the King of kings with full concentration (khushu’). Expose your children to Allah ’s creation and by taking them for walks in the parks, visiting the zoo, or watching the sunset – my children love it and they love watching the moon and the stars the most! Many of our Islamic activities are built upon the lunar system: teaching our kids to determine the times for salah through astronomy is an important skill. Let them understand the rising and setting of the moon and the sun – it reconnects them with Allah’s creation and Allah Himself. Teach your children swimming, horse riding, famous proverbs and good poetry. Gardening is another great activity you can do with the kids – my children love growing their own food! Cut the electronic baby sitter to a bare minimum – I mean the television. If you can do without it, the better. Enroll your kids in physical activities like karate, football and other games that will build their strength and stamina. Have family meetings or councils (shura) to discuss any issues and the smooth running of the family home – let family members take turns to chair the meeting. Children will learn the importance of the family unit and will love being in charge! Through such family meetings, we are teaching them to be leaders, to manage and be managed, presentation and speaking skills and how to resolve issues. Have fun – play a family game together. In my meetings with my children, we say one thing we love about each other and if someone is upset we all come together for a “family hug” – it’s such a great feeling of security and warmth knowing your family is there for you. Family meals together are another great time for bonding. A lot of important information is exchanged over meal times because everyone comes together to share their day, their plans and experiences. If we can establish strong family ties, our children as the future members of the ummah will be able to build a strong community in sha Allah. 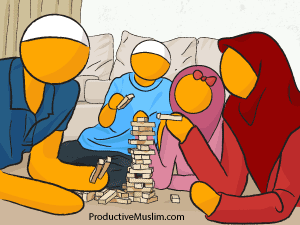 This is Part 1 of the Raising Productive Confident Muslim Kids series. Look out for some more fabulous tips coming soon in Part 2, in sha Allah! Khafayah Abdulsalam is a proud mom of four children aged between 10-21 years old. She shares the empathy of moms especially on family management and juggling the joys of motherhood. Over the last few years, she has successfully coached moms using Islamic principles to take moms through the journey of motherhood. Her primary profession is motherhood whereas she also works full-time as an Expatriate Payroll Specialist. Khafayah is a certified Mommy coach trained by Sheikh Muhammad Alshareef and a Master NLP practitioner. Khafayah is currently working on a new project that focuses on developing kids, parents and teachers, based on Islamic principles and NLP techniques.